A Trading Post Bobcat Skin. 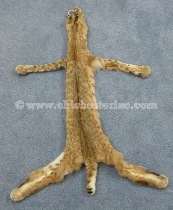 These bobcat skins are cased. Bobcat were listed as endangered in the U.S. for many years, but have recently been removed from the U.S. endangered species list. Our Gxx codes denote individual pieces. If you would like to order a specific bobcat skin, please go to our Gallery to pick the exact one shown. Genus and species: Lynx rufus. Wild. Bobcat are covered by CITES (as are all members of the cat family) and are not for export from the United States without a CITES permit. Not for sale to California.